I used to love shopping at Rich's! And was saddened when it eventually met with its demise through modern day mergers and acquisitions. But I have to admit, I had no idea the store had nearly 138 years of history and that it connected so strongly with the community. 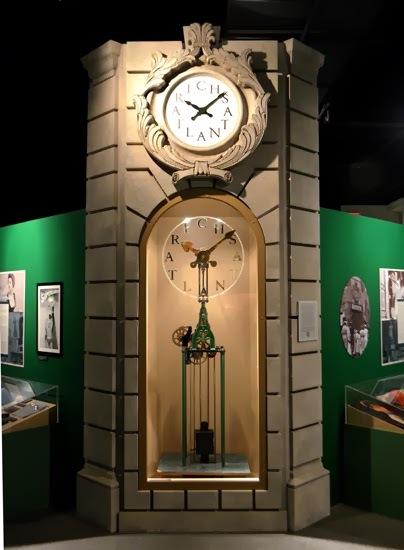 The current exhibition at The William Breman Jewish Heritage & Holocaust Museum, Return to Rich's: The Story Behind the Store, tells quite a captivating and an amazing tale! For those who do not know, Rich's was started by Mauritius Reich, a Hungarian Jewish immigrant, in 1867, who had immigrated a number of years before, driven largely by Antisemitism. With only $500 to start the store, which he'd borrowed from his brother, the legacy of Rich's was well on its way. 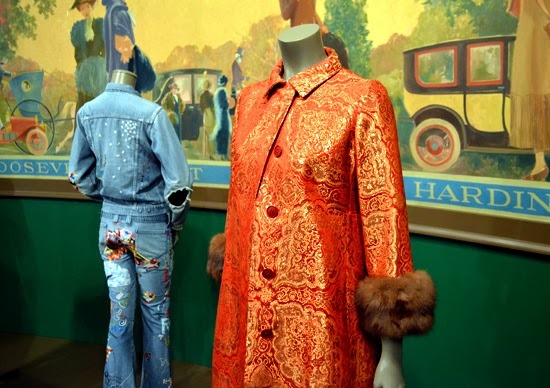 One of my favorite parts of the exhibition is the fashion on display. 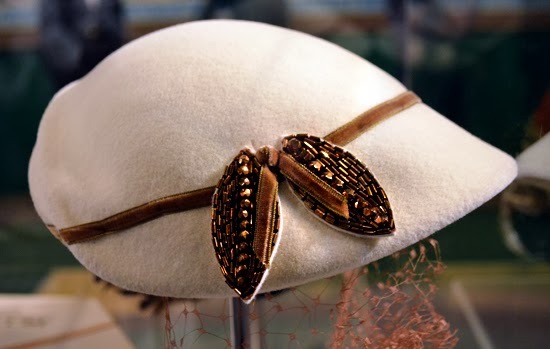 Atlantans frequented Rich's for everything from school clothes to haute couture...from wedding dresses to the latest party fashion, including some pretty awesome denim from 1974, also on display. 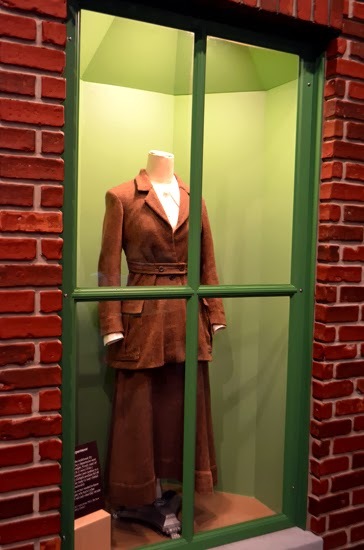 I was elated to discover that among the cross-generational couture is the full length velvet evening coat worn by Margaret Mitchell at the premier of Gone With the Wind right here in Atlanta in 1939. How cool is that?! The wedding dress on display was worn by Shirley Brinkman in 1955 and 26 years later by her daughter Teresa. 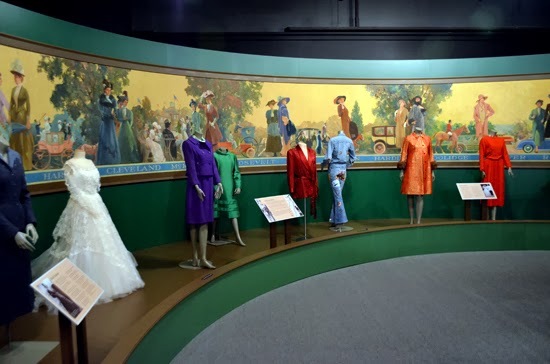 The wedding dress, and all the other clothes in this display were purchased at various Rich's stores and departments. Rich's even hosted an annual fashion show—Fashionata—which drew hundreds, primarily mother-daughter outings. There's a great section dedicated to shopper feedback and the 1967 book Dear Store by Celestine Sibley, columnist for the Atlanta Constitution 1941-1999. The book was an homage to Rich's and highlighted its dedication to superior customer service. There are also cards available for visitors who were Rich's customers and/or employees to share their memories. 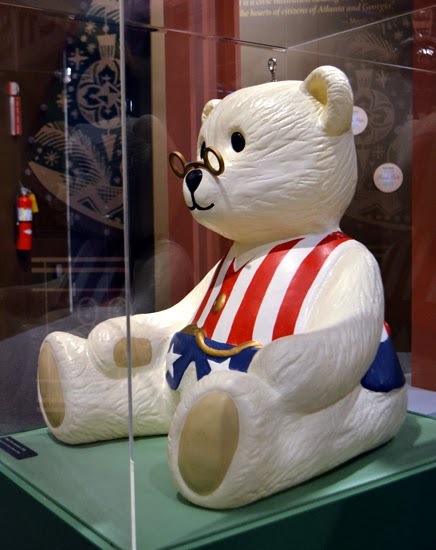 The GIANT patriotic teddy bear above—it's really big!—is an ornament that adorned the 60-foot tall Rich's Great Tree in 1976. Today, The Great Tree tradition continues as the Macy's Great Tree. The Rich's Great Tree tradition started in 1948 and the tree was typically 60-feet tall...a tree so massive that it could drink up 10 gallons of water a day! Rich's legacy is so intertwined in modern day Atlanta. The above sculpture, titled Composition, by world renowned artist Henry Moore, was purchased by Rich's in 1952 for the Atlanta Art Association, known today as the High Museum of Art. 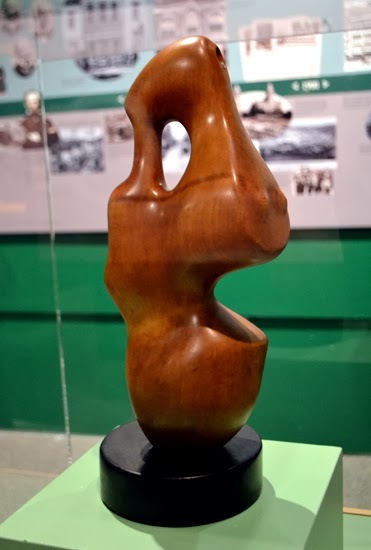 It was the first modern sculpture acquired by the Museum. Fascinating, right? One of the Rich's, Walter Rich, helped establish the Atlanta Dogwood Festival way back in 1936...my grandmother was a young girl when Atlantans were attending their first Dogwood Festival. Rich's keen insight and community involvement, I believe, contributed to many, many successful advertising campaigns, including the above partnership with the Atlanta Braves. 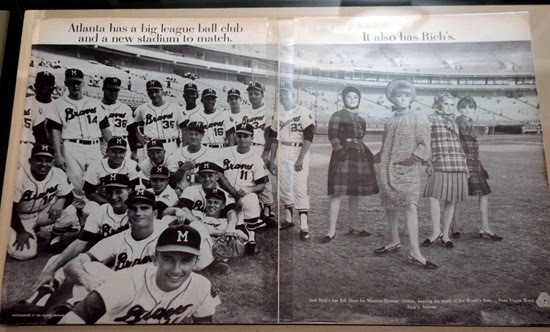 This particular photo was made shortly after the announcement that the Milwaukee Braves would be moving to Atlanta...so soon after the announcement that the players were still wearing hats with an "M" for Milwaukee. The heading reads, "Atlanta has a big league ball club and a new stadium to match. It also has Rich's." 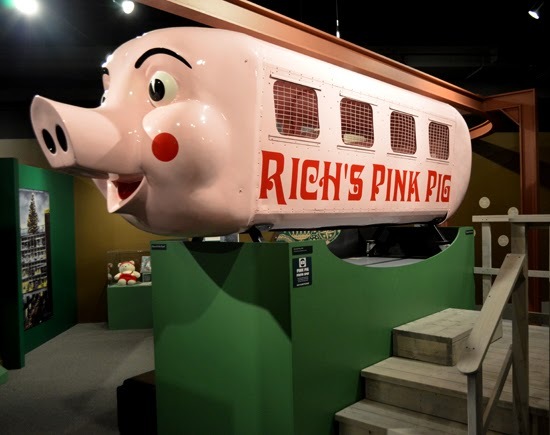 Another annual tradition began by Rich's was riding the Rich's Pink Pig during the holidays. The one's that belonged to Rich's, Percival and Priscilla, are now with the Atlanta History Center and Macy's has new, remodeled Pink Pigs...the tradition continues. As it turns out, the creation of the Pink Pigs was quite by accident. In 1956 Rich's debuted a monorail for children. A few years later, in 1959, the "Snowball Express" lost it's headlight. 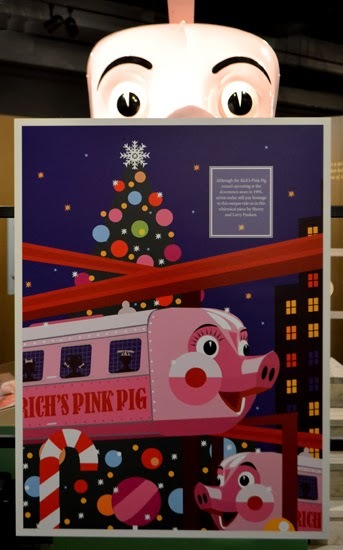 That's when the rail car received a snout, a curly tail and a coat of pink paint...thus the birth of the Rich's Pink Pig. Percival is on display in the Return to Rich's exhibition. There's a video near Percival with recordings of people who rode the Rich's Pink Pig as part of their holiday tradition. Some stated that they grew up thinking that the Pink Pig was a typical part of Christmas. Return to Rich's: The Story Behind the Store is on exhibit through Tuesday, May 27, 2014. I've barely scratched the surface here, so be sure to make plenty of time to take in the exhibition and to read the placards. You'll be surprised to learn just how much Rich's truly meant to the development of the Atlanta Community.